If protesters were really armed, posing a mortal threat, then where are the videos, asks Yehuda Shaul, a founder of Breaking the Silence, saying every sniper’s “spotter” films every shooting. These are the words of a top British orthopaedic surgeon, normally operating in a state of the art theatre at a London teaching hospital. 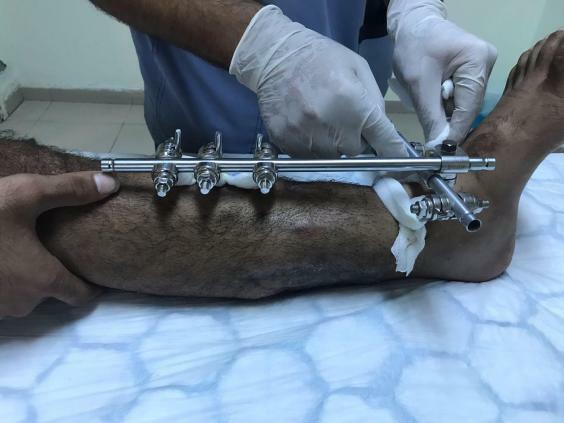 He was reporting on a typical day of work at Shifa Hospital in the besieged Gaza Strip, where along with scores of other international surgeons, he volunteers to save the lives of Gaza protesters – and, increasingly, their limbs. The limbs have been shattered by high velocity bullets, fired by Israeli snipers ranged along the barrier which separates Gaza from Israel, keeping 2 million Palestinians penned inside the strip, most of them refugees. The protesters, part of the ongoing Great March of Return, are demanding an end to their imprisonment in Gaza, and a right to return to what was once – and they say still is – their land on the other side of the fence. In the six months since the protest began, 220 Palestinians have been shot dead, according to the Hamas health authority in Gaza, whose figures are accepted as broadly accurate by independent medical sources, including the International Red Cross (ICRC), but today it is the horrifying number of catastrophic wounds that is breaking Gaza. 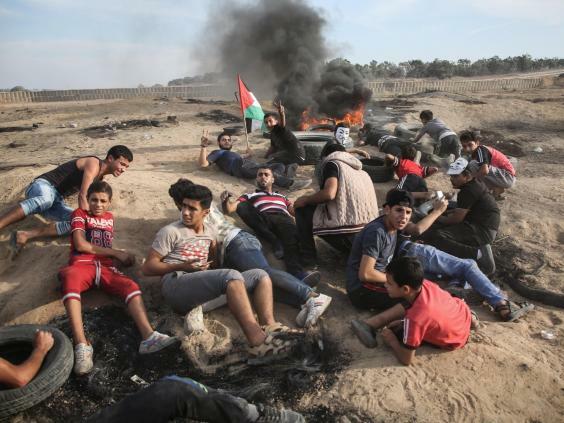 Since the start, there have been more than 24,500 casualties, says the Gaza authority, with at least 5,300 protesters shot – by high velocity gunfire, more than a quarter of whom need major and repeated surgery if the leg has any chance of being saved. Hundreds have been amputated and many more of those undergoing surgery will yet lose limbs. The international medics also say they have never seen so many identical wounds of this severity, though many have worked in war zones. “I have worked in Rwanda, Bosnia, Afghanistan, Soweto and I have never seen such a high number of catastrophic limb injuries of the same nature – anywhere,” says Professor Tom Potokar, a plastic surgeon and head of the Centre of Global Burn Injury at Swansea University, who volunteers in Gaza. The wounds are characteristic of explosive bullets, banned under international law, but are almost certainly caused by standard modern high velocity sniper fire, which on hitting young bodies at close range has an explosive effect. “If they hit a knee there’s no bone to speak of left. The fire is strong enough to rip a leg off a youngster,” says another orthopaedic surgeon, who like several of the international doctors working now in Gaza, didn’t wish to be named, fearing that if he publicly criticised the shootings, the Israeli government would not let his team back through the tightly controlled Erez crossing, the only entry point from Israel into Gaza. In all Gaza’s major hospitals, international burns specialists and anaesthetists are also working, usually alongside Palestinian colleagues, many of whom the internationals have trained. At all these hospitals, whatever part of the Gaza border area the wounded may have arrived from, the doctors confront the huge numbers of almost identical major wounds. John Wolfe, a retired vascular surgeon from St Mary’s Hospital, London, now working for the Red Cross, describes how his day began trying to stem bleeding from a teenager’s main leg arteries “blown to shreds”. As he sewed skin with the finest needles he was worried all the time that Gaza’s feeble electricity supply would cut out before the emergency generator kicked in, thus breaking the electricity supply to essential coagulation equipment which was helping control the flow of blood from his patient’s small capillaries. If the bleeding started up again the leg would be lost. 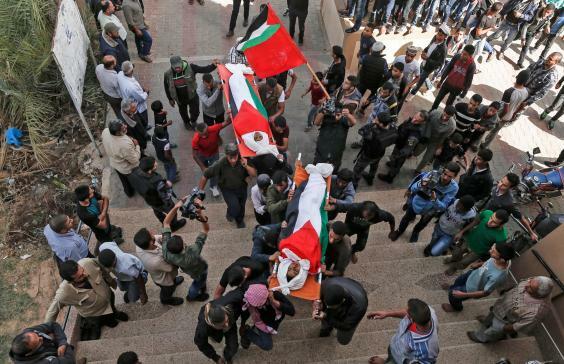 Wolfe’s latest sniper-hit patient had already suffered two heart attacks in the ambulance on the way to Shifa, such was the rate of bleeding from a massive open wound to the knee. A newly trained Palestinian plastic surgeon was on standby to graft artificial skin onto the “raw meat”. “A vast exposed wound is also a huge risk of infection,” he says. To make way for new patients the man would have to be moved back out into the community – into the dirt and dust – before the wounds had begun to heal. Wolfe didn’t know if the patient would live. As operations in theatres continue, outside in the waiting area scores of others wounded, moved out of the overcrowded hospital wards just days after being treated for identical wounds, are back for further operations. Slumped in wheelchairs, stumps horizontal, or propped up on sticks by parents, legs bristling with metal pins inserted into bone, all dazed by heavy doses of the painkiller tramadol. Ahmad Abu Seidu, aged 18, enters the room, hobbling on sticks. One leg has four huge metal pins, the leg so heavy and swollen he cannot lift it. “I went to the buffer zone to see what was going on one day, and I got shot. That’s it. I regret it now. They’re going to amputate I think. And I’m supposed to be in high school,” he tells a local reporter. “So sad. So difficult,” says a third British orthopaedic surgeon after at the end of a terrible day. His work in Gaza is unpaid, he volunteers to come during annual leave. He learned about gunshot wounds in Northern Ireland in the 1980s, but has also never seen the like of this. 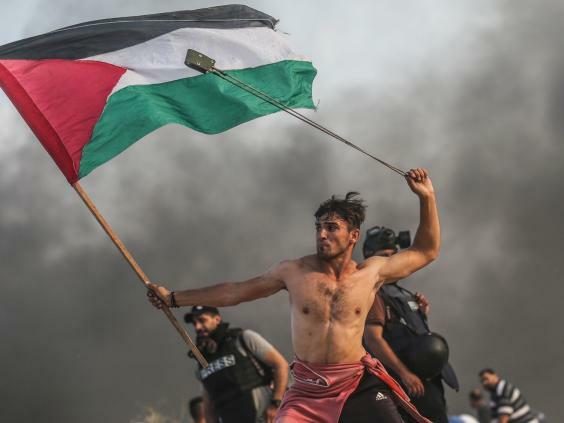 It is now more than six months since thousands of Palestinians gathered near the Gaza border on 30 March for the start of the “Great March of Return,” organised to mark the 70 anniversary of the Nakba – or “catastrophe” – when Palestinians were expelled from their homes or forced to flee during the 1948 war which led to the creation of Israel. More than 200,000 of these refugees fled to the Gaza area, evacuating nearby villages where they had lived for centuries. In December 1948 the United Nations passed Resolution 194, asserting that the refugees, who fled also to Lebanon, Syria, Jordan and the West Bank, should return when fighting ceased, but Israel refused. Of the 2 million Palestinians now in Gaza, held there under different forms of illegal Israeli occupation since 1967, more than 1.4 million are refugees, either survivors of the Nakba or their descendants, the rest of the population imprisoned there are indigenous Gazans. Since Hamas took local administrative control within the enclave in 2007, Israel transformed the nature of its occupation again. Having already withdrawn its troops from the ground, it now imposed a blockade by land and sea. The strip, just 25 miles long and seven across at its widest, borders the Mediterranean and will be uninhabitable by 2020, according to the UN. As crowds massed in March for the start of the Great Return March there were fears of retaliation from the Israeli side. Youths threw stones and sling shots towards the border fence, others tried to cut the fence: provoking and goading Israeli soldiers a time-honoured pastime for Palestinian youth. But the focus for most ordinary Palestinians here was the anniversary of the Nakba, which they saw as a rare chance to regain some dignity by remembering their past, pitching tents to eat and dance, or carrying festive banners proclaiming names of their former villages. “At first we thought it might make a difference,” says 52-year-old Hala Maghari, a mother of four and director of nursing for the United Nations Relief and Works Agency (UNRWA), responsible for Palestinian refugees, who was there on the first day. Neither she, nor any Gazan, was prepared for what came next. Before the protest began, Israel’s snipers were ranged at the fence, and by the end of the first day 60 of the protesters were dead and Gaza reeled. John Wolfe, the vascular surgeon, had been in Gaza training Palestinians in vascular surgery since the war of 2014, a time when Hamas leaders realised that far too many of the 2,020 dead in that Israeli onslaught had simply bled to death, through lack of medical expertise. Four years later, Wolfe was to confront a situation in which he needed to train scores more and fast, to stem bleeding the likes of which he’d never experienced. One horrified British surgeon compared the scene to the massacre at Amritsar, where in 1919 the British Indian army fired their rifles into a crowd of unarmed Indians in the Punjab, famously depicted in the movie, Gandhi. Since the first days, the protests have continued, as has the killing, though at a slower rate. Although the death count has slowed, however, horror of the shootings has only escalated further as injury figures showed a rapidly growing number of serious wounds to lower limbs, which Gaza hospitals simply could not cope with. On a single Friday – 26 October – 180 protesters were seriously wounded by high velocity bullets, with 655 wounded by gunshots throughout October, according to the Red Cross. 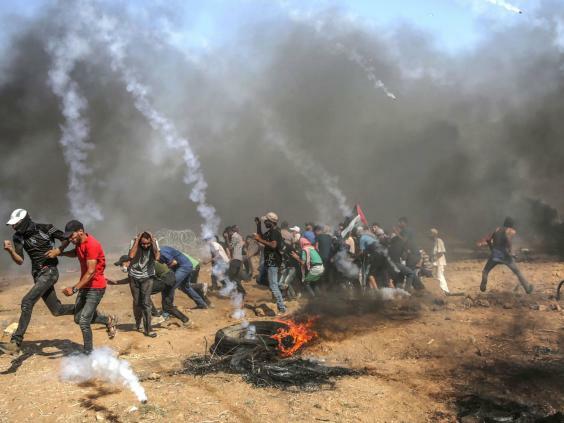 An Israeli army spokesman says “extensive warnings” were issued to the demonstrators of the risks they faced if they approached the fence and that tear gas was used to deter them; the force used was always “proportionate” and in accordance with international law. In the first 10 days of November the number of wounded has dropped, suggesting that Egyptian mediators may be succeeding in defusing tensions, but protests are now occurring on Mondays at the northern border near the sea shore, as well as on Fridays by the eastern fence. Meanwhile, Israel has made no promises of de-escalation and Gaza health chiefs remain over-burdened and are crying out for more equipment and more medics. Hala Mughazi, the chief nurse who hoped for peaceful change in March, is instead overseeing the biggest emergency nursing response UNRWA has ever known in Gaza, organising treatment in clinics up and down the strip for thousands with “wounds so big you can put your hand through them,” she says. Outside her clinics, pitiful groups of metal pinned figures gather daily along with others hobbling with the help of family. She herself has two nephews, and one cousin among the Great Return March wounded, all in the leg, and one now at risk of amputation. Gislain Defurne, head of the Red Cross in Gaza, spells out the catastrophic consequences of these injuries for the victims and for the whole of Gaza. “It is overwhelming. You cannot compare what is happening here to what is happening in any other place. I do not know anywhere like it,” says Defurne, who has previously worked for the Red Cross in Darfur and Afghanistan. Gaza’s situation is “unique” he says, describing how desperate, exhausted people all traumatised by recent wars and strangulated by the siege are living with no resources, no clean water, only six hours of electricity a day, and no hope of work or an end to the blockade. The Red Cross has more than quadrupled its staff in Gaza in recent weeks, and constructed a special emergency clinic for the injured. Other international medical agencies have also geared up a huge emergency response, sending into Gaza as many qualified doctors as they can recruit, and as many as Israel will allow in. The Norwegian charity Norwac is amongst international groups sending volunteers. Israeli Physicians for Human Rights is also organising monthly convoys of Palestinian-Israeli doctors into Gaza, but each convoy, as with international arrivals, is faced with bureaucratic impediments to travel and delays at the border. Israeli doctors are banned altogether from entering Gaza; the reason given by Israel is that their safety is at risk. According to a spokeswoman for the Israeli human rights group, on return to Israel, the Israeli-Palestinian medics report on the impossibly primitive and over-stretched conditions they have to work in in the Gaza hospitals, compared to Israel’s first world medical facilities. 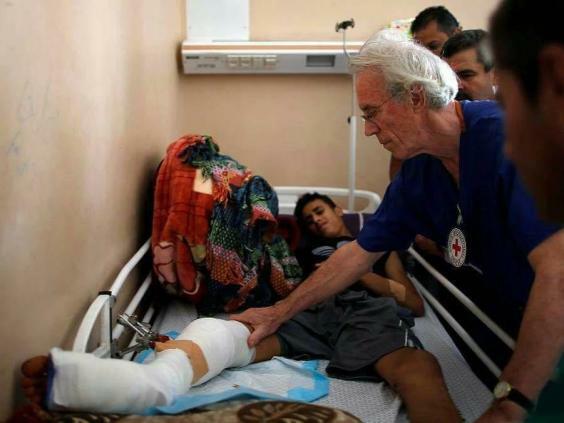 At the same time, Médecins Sans Frontières (MSF) has also massively increased its presence in Gaza by setting up four surgical teams in hospitals, treating 2,400 patients since March – 90 per cent with gun shot wounds. They are also providing post-operative care in five new clinics, up and down the strip, where crowds of wounded “with scaffolding” also gather, usually with families, to seek dressings for still-bleeding wounds, medicines for gas inhalation, pain killers and psychological support. Dr Abu Wada, a 28-year-old Palestinian doctor overseeing MSF operations, sees “no end to the horror” as every week, hundreds more acutely wounded victims are added to the system, all needing long-term follow up and repeat operations. He wonders when the Israelis will stop their lethal fire or at least de-escalate the shooting to reduce the stream of wounded to give the medics breathing space. The answer is not any time soon, according to Israeli commanders whose view from the other side of the fence is, unsurprisingly, quite different from that of Wada. “We in the military are tasked with defending our sovereign border, and providing security for our civilians,” says one senior Israeli officer. “Right now on the other side of the Gaza border we see a threat which is not a peaceful demonstration but a violent riot – organised by the terrorist organisation, Hamas, with the goal of overrunning the border and going into Israeli communities, killing Israelis and abducting Israeli soldiers”. The root cause of the riots, in his view, was the determination of Hamas to find a new strategy with which to endanger Israel, following the loss of its “terror tunnels” – all recently destroyed by Israel, he asserts – and following the increasing efficiency of Israel’s Iron Dome defence system, which he says can today knock out 92 per cent of rockets fired from Gaza. Left without any threatening capability, the new strategy of Hamas was to hijack the Great Return March and turn it into a terror riot, using “a mob of hundreds, thousands, with fence cutters and trying to breach the fence”, continues the lieutenant colonel. Hamas’s plan was first for Palestinian civilians to breach the fence – civilians who he concedes were often “desperate and unemployed” and who were “preyed on by Hamas” would do the fence cutting. Once the fence was down, so he says, Hamas terrorists would then move in behind the civilians to kill Israeli citizens in a “bloodbath” which was “the sole purpose of the riot”. At first, he continues, a shoot to kill policy was considered appropriate to counter the Hamas strategy, though only those identified as armed Hamas fighters coming too close to the fence were shot. The officer had himself been at the fence and had seen grenades and explosive devices land close by, as well as “marbles and other projectiles”. One Israeli soldier has been killed at the fence and five lightly wounded. The suggestion that the people were demonstrating – not because they wished to murder Israelis – but to protest against the loss of their right to return to their homes, he describes as “the biggest hoax that Hamas has been able to sell the world”. He appears unaware that many of the refugees had in 1948 been forced from villages a few kilometres across the fence, and when pressed to comment further on the rights of the refugees to return to their land, he says this would be “venturing into politics, which is not my job”. The Israel Defence Forces (IDF) officer is nevertheless in no doubt that the use of high velocity ammunition was legal: “It is the same used by Nato, in Iraq and Afghanistan, and in other counter insurgencies”. Human rights groups dispute almost every element of this analysis. Amnesty International has called Israel’s sniper fire “a murderous assault” on the protesters, calling on governments worldwide to impose a comprehensive arms embargo on Israel. Israel’s own Breaking the Silence, a group formed by discharged and dissident Israeli soldiers that analyses and criticises IDF tactics in the occupied territories, asks for IDF proof that those shot dead were all Hamas “terrorists”, saying it would be impossible for a sniper or his “spotter” to know if the man in their sights was a member of Hamas or a youth trying his luck with a sling-shot. If protesters were really armed, posing a mortal threat, then where are the videos, asks Yehuda Shaul, a founder of Breaking the Silence, saying every sniper’s “spotter” films every shooting. Shaul also challenges the Israeli military to explain the shooting of children, women, journalists and medics, most famously the shooting dead of a 21-year-old woman medic, Razan al Najjar, or last week the shooting dead of three boys whom Israel said were planting bombs, while their parents said they were chasing birds. It seems likely that, in order to defuse the growing international criticism of the slaughter, the rules of engagement were changed and Israeli snipers came under new orders to shoot to kill less and shoot to maim more, Shaul suggests. But the continued use of high velocity ammunition, rarely used in the West Bank and rarely used even in the Second Intifada, is calculated to cause maximum terror, he says. If analysts are right in saying that the Israeli government calculated that “leg injuries” would reduce pressure on them to cease fire, this calculation proved correct; the shift to shooting legs meant international criticism died down and the journalists moved away. But as reporters and cameramen passed out through the Erez turnstiles, doctors – not needed for the dead but more than ever for the wounded – passed through the other way, often carrying their equipment in heavy suitcases, expensive instruments and prosthetic limbs as well as skin grafts, fine needles, sutures. The Israelis could rest assured the doctors would not shout out loud about what they were seeing for fear of being refused entry next time to continue their work, but the shock of what they have seen, and the silence shown by foreign governments, has clearly unsettled some. “The first patient I operated on was 12. He had been shot through the knee and lost his leg. How can anyone bring themselves to target a child of that age? He was no threat at all. Children in our wards were shot for shouting and lighting fires,” says Wolfe. And now there is a new emergency: to prevent infection. Resistance to antibiotics is rife in Gaza, and creating a sterile environment in such overcrowded and badly resourced hospitals is nearly impossible. As a result, the wounded are at high risk of developing osteomyelitis, an infection of the bone, or “melting bones”, leaving them with permanent serious disability. Moreover, the wider effect of the mass wounding on Gaza is only now starting to be understood as most other elective surgery is being cancelled to make way for the wounded, worsening the general health crisis. The impact on mental health, particularly Gaza’s escalating suicide rate, is bound to be severe, psychiatrists predict. “When the wounded know they can’t get married, and have even less chance of work than before, the despair will throw many over the edge,” says Mughari, the UNRWA nursing director. Behind closed doors, other more personal tragedies are unfolding as an already fragmenting social network is further shattered.